NEWLY RELEASED MILITARY records feature a name most people would associate more with a Friday evening treat than guerrilla warfare against the Black and Tans. The documents reveal the involvement of Leo Burdock, the namesake of one of Ireland’s most famous chipper chains, in the War of Independence, when he was a member of 3rd Battalion C Company of the IRA. The files form part of the latest release from the Military Service (1916-1923) Pensions Collection. Members of groups such as Cumann na mBan and the IRA who could prove their active service between the Easter Rising and the end of the Civil War were able to apply for a pension. These documents are slowly being processed and released to the public. Today, files relating to 1,576 veterans have been released. Leo Burdocks first opened in 1913 in Christchurch, with Leo’s parents Patrick and Bella naming it after their 13-year-old son. The chipper’s website details how “Leo was a regular face in the early morning Dublin fish markets, rising at 5am most days to source the freshest catch”. Burdock’s file reveals that he joined the IRA during what one letter describes as “the hottest period of the Tan War”, when he was in his twenties. The file contains several letters from other former IRA members detailing his involvement in ambushes on the British auxiliary forces, and later, having stuck to the anti-Treaty side, attacks on National Army troops. In his own evidence, Burdock lists three major incidents in the War of Independence – two attacks on trucks carrying Black and Tans on Grafton Street and Dartmouth Street, and the burning of military goods at Harcourt Street. At the outbreak of the Civil War he was active during the attack on the Four Courts but elsewhere in the city, and that later was in Shankhill on the Night of the Bridges. He was later arrested but released after a hunger strike, and was involved in two more attacks on Oriel House. However, when Burdock applied for his pension in 1945, he failed to declare that his involvement continued long after the Civil War truce. 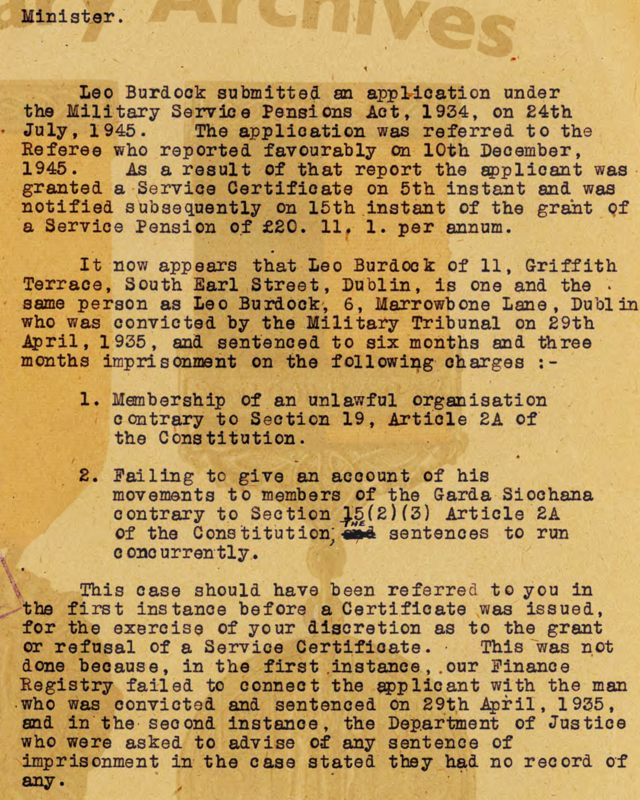 A letter in the file to the Minsiter for Defence details how the Leo Burdock of 11 Griffith Terrace, South Earl Street, who was applying for the pension was the same Leo Burdock was 6 Marrowbone Lane who was arrested in 1935. He was convicted at a military tribunal of member of an unlawful organisation, and failed to give an account of his movements to An Garda Síochána. However, this didn’t affect his pension, and it was still awarded and paid up until his death in 1966. Read Leo Burdock’s file in full here (9.6MB) and here (17MB, containing more detail of his service). Email “Fish and chips meets Black and Tans: Details revealed of Leo Burdock's IRA service”. Feedback on “Fish and chips meets Black and Tans: Details revealed of Leo Burdock's IRA service”.